Title: Elias Clayton. Coroner's Reports, Duluth District. No. 60. Title: Isaac McGhie. Coroner's Reports, Duluth District. No. 62. Title: Elias Clayton. No. 7431. June 30, 1920. Title: Isaac McGhie. No. 7429. June 30, 1920. Title: Elmer Jackson. No 26871. Title: Elias Clayton. No. 26873. Title: Isaac McGhie. No. 26872. 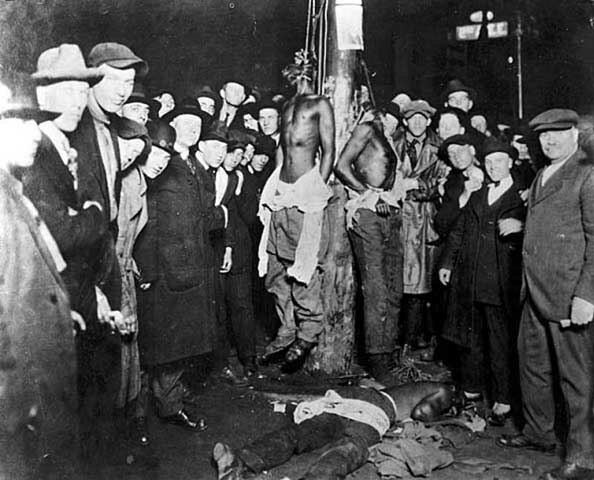 Title: Postcard Image of the lynching of Elias Clayton, Elmer Jackson, and Isaac McGhie. Title: Telegram from the National Association for the Advancement of Colored People to J. A. A. Burnquist, June 16, 1920. Title: Telegram from the National Association for the Advancement of Colored People to J. A. A. Burnquist, June 17, 1920. Title: Letter from R.D. McKercher to J. A. A. Burnquist, June 16, 1920. Title: Letter from J. A. A. Burnquist to R.D. McKercher, July 2, 1920. Title: Letter from the Albert DeSilver to J. A. A. Burnquist, June 16, 1920. Title: Letter from J. A. A. Burnquist to Albert DeSilver, July 2, 1920. Title: Letter from Mary White Ovington to J. A. A. Burnquist, June 18, 1920. Title: Letter from J. A. A. Burnquist to Mary White Ovington, July 2, 1920. Title: Letter from Mary White Ovington to J. A. A. Burnquist, July 9, 1920. Title: Letter from Walter F. White to J. A. A. Burnquist, July 23, 1920. Title: Letter from J. A. A. Burnquist to Walter F. White, August 12, 1920. Title: Letter from Walter F. White to J. A. A. Burnquist, August 16, 1920. Title: Letter from Walter F. White to J. A. A. Burnquist, November 29, 1920. Title: Letter from J. A. A. Burnquist to Walter F. White, December 8, 1920. Title: Letter from Walter F. White to J. A. A. Burnquist, December 11, 1920. Title: Letter from Mary White Ovington to J. A. A. Burnquist, July 6, 1920. Title: Letter from Maud Craig to J. A. A. Burnquist, June 19, 1920.